Cooking with these four organic herbs will ensure that your meals are packed with healthy nutrients as well as incredible flavor. If you cook homemade meals regularly, you probably have at least a few go-to recipes that call for fresh herbs. If you don’t have these herbs on-hand on a regular basis, you may consider them to optional, but they are not. 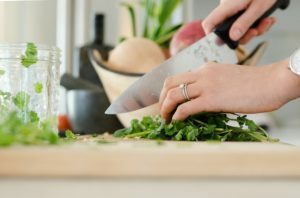 Not only do fresh herbs enhance the flavor of any dish, but they also have many minerals and vitamins that will give your meals an extra dose of nutrients. Cooking with these four organic herbs will ensure that your meals are packed with healthy nutrients as well as incredible flavor. If you cook with basil often, you might see that it runs out at your local grocery store sooner than many of the other fresh herbs. This is because basil is one of the most popular fresh herbs in the world. Basil is a favorite among chefs who primarily focus on Italian cuisine as it adds a slightly sweet, peppery flavor that pairs best with tomatoes and mozzarella. Basil is also full of cancer-fighting, pain- and fever- reducing, and cancer-preventing properties. Cilantro is another cook favorite as it is hugely versatile and used in a wide variety of cuisines. From Mexico to India and beyond, cilantro is one of the most important fresh herbs on the market. In addition to its magnificent taste, its packed with dietary fiber, vitamins, minerals that are critical to living a healthy life. Parsley looks a lot like cilantro, but the two flavors differ immensely. Parsley offers a mild, bitter flavor, which is why it’s perfect for balancing savory dishes. The health benefits of parsley are unbeatable, and it is recognized as one of the world’s healthiest superfoods. Parsley is even known to help prevent breast cancer. Thanks to a chemical found in parsley called apigenin, cancerous tumors develop at a much slower and reduced rate. Thyme is another fresh herb that greatly enhances the flavors in many different dishes. It is a favorite among chefs since it pairs perfectly with many dishes, including poultry, lamb, veal, stuffing, chowders, soups, and fish sauces. The subtle, dry, slightly minty flavor of thyme gives everything from meats to soups a unique, earthy flavor. But did you know that thyme is packed with antioxidants as well? Thyme will bring the fresh flavor your meals need while also helping your body fight against any potential diseases. This entry was posted on Friday, May 18th, 2018 at 1:29 pm. Both comments and pings are currently closed.